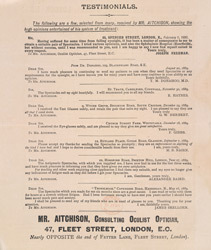 This leaflet advertises Mr James Aitchison, who opened his business in Fleet Street in 1889. He was a leading figure in the promotion of scientific sight-testing in Britain in the 19th century. In 1927 Aitchison & Co merged with another firm ‘Dolland & Co’ and they became the well known opticians ‘Dolland & Aitchenson’ that we see on the high street today.